Tiananmen Square is a large city square in the center of Beijing, China, named after the Tiananmen Gate (Gate of Heavenly Peace) located to its North, separating it from the Forbidden City. 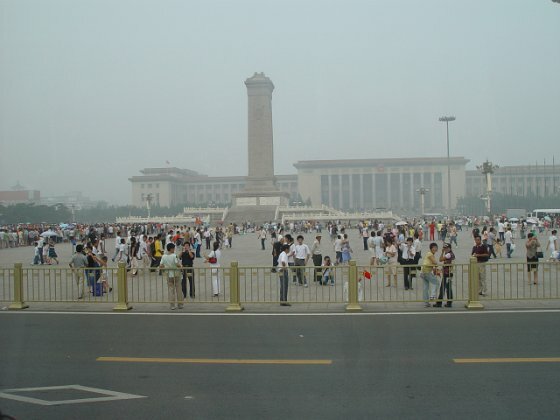 Tiananmen Square is the largest city square in the world (440,000 m² - 880m by 500m). It has great cultural significance as it was the site of several important events in Chinese history. Outside China, the square is best known in recent memory as the focal point of the Tiananmen Square protests of 1989, a pro-democracy movement which ended on 4 June 1989 with the declaration of martial law in Beijing by the government and the death of at least hundreds of protesters.